In this review of the Behringer Eurolive vq1500d we are going to covering 5 important areas which include key features, what we like, pros and cons, who is this product best suited to and what customers who have bought the speaker are saying about it. Sound and Power Value – The Behringer Eurolive VQ1500D features a boost knob that has a frequency targeting the 40 to 90 Hz range. Its Boost switch provides a +10-dB boost. Additionally, the High Cut dial affects only the audio signals that have been directed to the speaker and does not affect the Thru signals. This allows precise control over the frequency of the amplifier. When you turn the level knob, the input gain will compensate for frequency cancellation between the subwoofer and the satellite speakers with the phase switch. The LEDs show the operational status by illuminating the power, signal present, and limit. Class D Technology – The technology of this subwoofer’s Class D design provides a reliable and efficient performance every time its turned up to the max, all while being easy-to-use, lightweight, and effortlessly transported. The Eurolive VQ1500D’s amplification saves on power, which maximizes energy efficiency and helps to protect the environment. The elimination of unneeded weight eradicates the requirement for heavy power supplies and huge heat sinks. So, go ahead, push the subwoofer’s volume to the max, you’ll still receive the high-end sound you’ve been dreaming of. Custom-Designed Transducers – That high-quality sound you’ll hear comes from the speaker’s 15” long-excursion low-frequency transducers. The built-from-scratch and custom-design technology leaves you with a sound that is sure to impress. The flawless performance and professional results are provided from the Behringer subwoofer’s ability to provide extremely high sound pressure levels: 122 dB (Full Space, 1 W @ 1 m), with a frequency range of 40 – 200 Hz. Powerful, Precise Base Production – From watching a favorite movie in our home theater to making sure the dance floor can feel the Dj drop the bass, this subwoofer had it covered. With exceptional performance that comes from this sub, we were able to satisfy both. We were impressed with its ability to produce extremely high sound pressure levels, thanks to its powerful, custom LF transducers. It is easy to take control with the XLR inputs and outputs, balance the perfect sound with the Boost Frequency knob and Boost switch. Its steel grill offers optimal speaker protection allowing us to turn the beats up, all the way up. The Extras –This subwoofer gave us that heart pumping bass but kept us from breaking a sweat off the dance floor because of its easy to transport features. Thanks to cutting-edge technology and ergonomically shaped handles, it is much lighter weight than the competition. It can easily be mounted on spacer poles because of its conveniently designed socket features. We also loved how easy it was to monitor with aid from the LED for Power, Signal, and Clip. Even more impressive is its small environmental foot print. Thanks to technology, it requires less energy while still providing a powerful sound. Overall, we could not ask for deeper, dance party bass. The perfect quality for the perfect price! Whether you are hosting an at-home movie premiere or performing at your town’s up-and-coming new venue with your band, this subwoofer has you covered. This system is extremely mobile with its light weight and convenient carry handles. The advanced technology consumes low power making it energy efficient. Its intelligent limiter produces professional sound quality and protects your subwoofer at any volume. 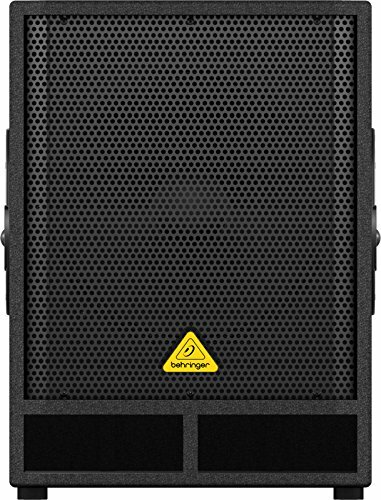 If you need a reliable, easy setup sub that will bump up the bass for hours, then try out the Behringer Eurolive VQ1500D. Customers who have purchased the Eurolive VQ1500D subwoofer were impressed with the clear sound and booming base that they received. They loved the portability and how easy it was to set up and control. 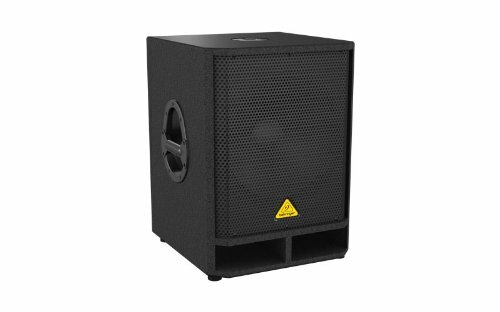 Many customers found it the perfect addition for small to medium size PA systems. It was a great way to add volume without sacrificing the sound and allowing the audience to feel the thump of the base. Most buyers recommended the sub for small to medium band and DJ gigs or home audio set-ups but would prefer a sound boost in larger scale venues. Buyers were overall satisfied and highly recommended the VQ1500D. And for the price, it’s a steal. 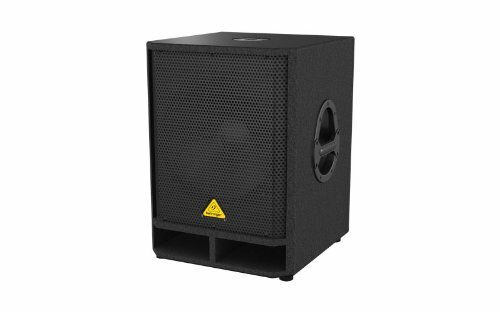 If you are looking for a sub that can provide powerful sound to keep your party going, then this is the one for you. The powerful 15” long-excursion transducer provides precise and room rumbling bass. Its tunable and switchable Bass Boost plus Phase switch allows for the ultimate performance. Its ergonomically shaped handles make the sub extremely portable while the pole sockets provide easy mounting with commercial spacer poles. The built-stereo crossover makes it perfect for use with any Behringer 2-way loudspeakers. 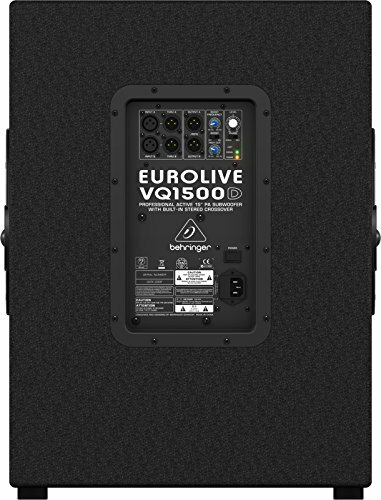 The Eurolive VQ1500D brings an explosive sounding bass anywhere, from your home entertainment to your band’s weekend show. It is sure to keep you or the audience moving to the beat.